This character design was done for my character design class. We were to create a cartoon mascot for Singapore. I started off toying with ideas of doing an orangutan as a tribute to the late Ah Meng and a revision of the Singapore Parliament mascot Parley (a winged lion) which I did for a proposal to them previously (they didn't take up the project so I kept the character design). But the orangutan didn't quite work out, and Parley wasn't something I was particularly interested in developing. Then I sketched out a Sarong Party Girl (SPG), but of course nobody would want Singapore to be associated with those, so I dropped the idea almost immediately. It was then a friend of mine suggested the Singapore Airlines (SIA) air stewardess, otherwise known as the Singapore Girl. Now, that was a start. After some sketches, I found that the character didn't have the right look. Either they looked too complex or sultry (I didn't want an image of a vixen), or their hair wasn't right. But one random sketch with very simple eyes, lips and a nice pose seemed to stand out, and that became the final version above with minimal revisions. My instructor suggested I created a comic strip out of this. But I think SIA may take legal action first if they ever get wind of it. 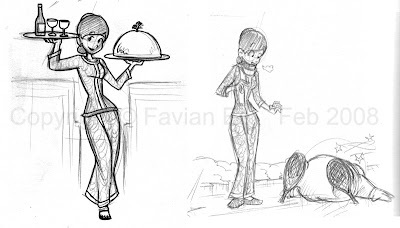 The character Singapore Girl (above) is © to me (Favian Ee), Feb 2008. 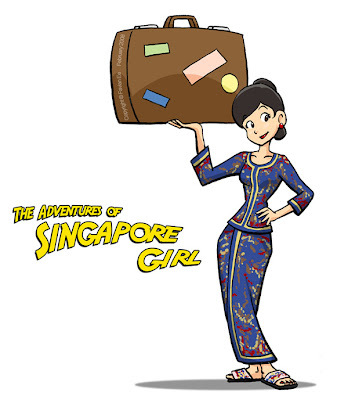 The real Singapore Girl is a brand and trademark owned by Singapore Airlines. Your drawings are crazy good.... And have gotten better and better over the years.